Taking well-composed, atmospheric photos is never easy. Once upon a time when I was a magazine editor I had photographers I worked with and I learnt a great deal about how much I had to learn about taking good photos. So when I found this blog from someone who knows how to take good photos in the tango environment I thought I would add it here. I take photos, but not good ones, and I realise how important they are to a good website. Well worth reading - particularly if you are can afford to go out and buy a camera for the task! So check this out. Last night after a brief visit to Sculpture by the Sea at Bondi, and a box of yummy fish and chips at Fishmongers (best fish and chips in Sydney!) we made our way to the weekly Patio de Tango milonga at Rose Bay RSL. Teachers from Buenos Aires, Sebastian Archaval and Roxana Suarez had just finished a workshop and the place was crowded. I counted at least 80! not bad for a week night. TangoAustralia sent them an email asking for an interview for the website, but no answer was the stern reply! so we are simply running a Youtube video. A good promo but an interview is always a bonus. So I know little about them apart from the fact the Roxana speaks reasonable English, they are beautiful dancers and Sebastian is a one-time world tango champion. They have a blog which is way more interesting than their website. . I was kicked on the dance floor the other night, not intentionally, but boy did it hurt. I sat out the next dance and no sooner had I sat down than a couple of other women commiserated with me about the dangers of the floor. Why is it that some Australian tangueras dance without thought of others? Is it because this how they behave in the wider world? Do they drive like they own the road? Do they ignore queues? Actually I don't think so. On the dance floor I suggest that they are so carried away by their ability to do high boleos and impressing other dancers that they forget their manners! 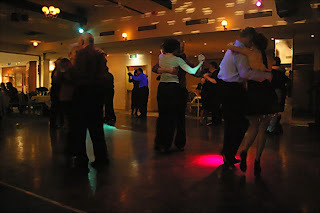 Saturday's milonga at Gladesville was a success, so I am mightily relieved. It was obviously the other venue that was the problem... so I won't be going back there. Lovely crowd of dancers, very friendly vibe and the venue is perfect so I hope we won't have any trouble keeping it. Excellent parquet floor, very good (working!) lighting for the dance floor, round tables (wonderbar!) and a bar as part of the package. And Nelson and Liz's Canyengue class was a success. We need to do it on a regular basis so that when DJs play canyengue those who care know who to dance it. Got some ideas for milongas with a twist in the next few months so am keeping my fingers crossed about this venue.